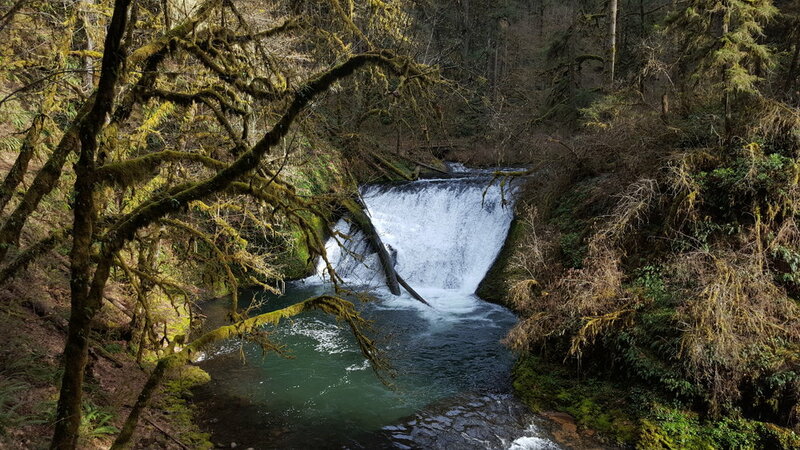 Silver Falls has been on our family bucket list for years, and we finally were able to make it there this last spring to be wowed beyond our expectations. To begin with, the drive out there is gorgeous; rolling green hills, and wide open views for mile. We took our time driving there so that we could take it all in. There are four different trail heads that you can park at. South Falls Trail, Winter Falls Trail, North Falls Trail and Twin Falls Trail. We decided to park at the main parking lot at the South Falls Trailhead and we are glad we did because the other lots were pretty packed when we finally reached them by foot. At the south lot there are multiple ticketing machines throughout, so we didn't have to wait in the longer line of the one right by the entry to the trail. There are also bbq's, picnic tables, and shelters for you to spend the afternoon if you just want a break. We started out at the South Day Use Area; you will want to use the bathrooms there because the only other opportunity is to use a vault toilet at the North Falls trailhead. There is also Silver Falls Lodge there that we didn't explore because after using the facilities we set out for the Trail of Ten Falls. We decided to take the Rim Trail to our first destination, Winter Falls. It was a .9 mile trail that was pretty wide much of the way and of course it was lush and green. Once you get to the trailhead you have to wend your way down a steep trail to the viewpoint of Winter Falls. That is where we took our lunch break. Winter Falls is 134 feet tall, but will revert to a trickle during the summer and sometimes even disappear completely. There is a bench to view the falls, and Ilias and I even got down to the bottom so that we could get up close and personal. The North Falls trail was a pretty little trail and the falls were only .3 miles from the start so you don't want to skip this one. The moss covered rock walls were gorgeous with seasonal waterfalls along the way. Ilias got really close and had I not stopped him he would have gotten closer. Beware because the closer you get the more slippery it is. We then went back the way we went on Rim Trail and then down Canyon trail that took us down a pretty steep, but beautiful staircase to get to the enchanting North Falls. We were all overcome with the beauty and stared in awe as we walked BEHIND the falls. We just sat there feeling the mist, listening to the thunder as the powerful waters cascaded down. Ilias and Olivia loved it, dancing in the mist. Next up was Twin Falls a wide fall that was is split in two by a rock in the center. It was located on a small loop off of the Canyon Trail and we could only see it from above so we took a quick peek and then headed on. This is where you could end your hike and take the Winter Falls trail back over the bridge and along the river, but we continued on. Middle North Falls was one of my favorites because you could get a great photos in all 360 degrees. Make sure you go down the trail because you can walk behind this fall and you can get really close. Olivia wanted to stay longer so that she could campout in the little cave that was carved out in the wall, but we weren't even halfway done so we needed to get back on the trail. Drake Falls was not that from Middle North Falls, but unfortunately only view of Drake Falls was from a platform above. It's a pretty little fall at only 27 feet tall. Next up: Double Falls. Double Falls is the tallest in the Trail of Ten Falls at 178 feet. We got right up close and the powerful wind that came off the tumbling falls was so strong it took out our little drone down. 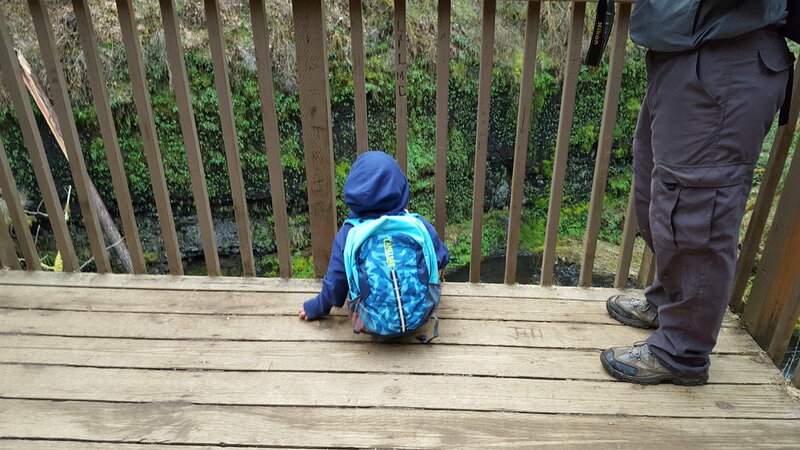 Ilias and Olivia especially loved this waterfall because they could get close to the creek. Of course as kids always are, they were tempted to jump in in spite of the fact that they were fully clothed for spring weather. The next length of our hiking was my favorite. I think because the light was gorgeous as the sun started going down adding more magic to the canyon. One of the smallest of all of the falls it is only 30 feet tall and the view is limited. Continuing on the trail we came to a bridge and then a steep hill. This is where we got the best view of North Silver Creek. 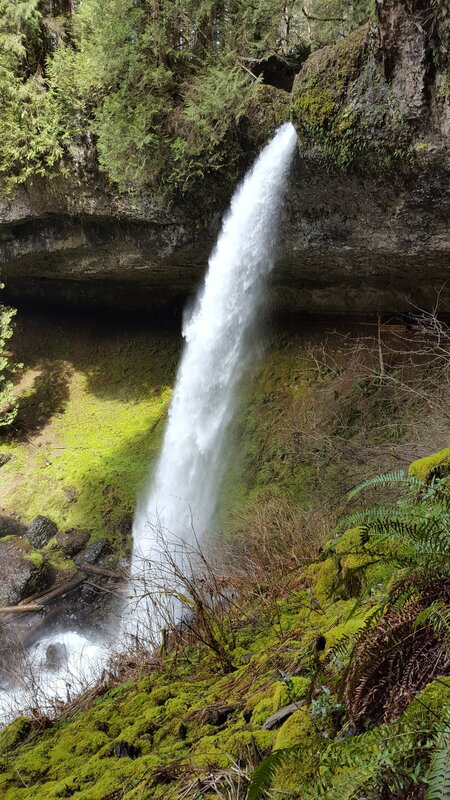 Lower South Falls is 93 feet falls and is the third on the trail that you can go behind. The path is a bit narrow and every bit as beautiful as all of the others. By the time we got to Lower South Falls we were getting quite tired but we had no other way to go but out…and up because right after the falls there was a huge staircase. This was probably the hardest 1.3 miles I had ever hiked because with all of the offshoots that we had hiked we were at mile 10+, but I survived! South falls is one of the most photographed falls in Oregon and on the Trail of Ten Falls. We can walk behind it and had you can also photograph the 360 degree views. There was a bridge straight across from it giving a perfect opportunity to photo from the front. It was a magnificent ending to our waterfall adventure. The whole hike took us about five and a half hours and totaled 12.2 miles. It was such an amazing day; we felt like we were in another world. Even though the parking lots were full it wasn't too crowded on the trail so we wondered if people just checked out the falls close to the trailheads. No matter, we appreciated the sounds of nature that surrounded us; the crunch of leaves under our feet and the thundering of the falls as we approached each one making us feel like we were the only ones there. We hope to visit in different seasons so that we can see the changes that summer, fall, and winter bring, because we know that each season gives a view of a whole new world. A few things that we learned on this hiking trip. If you can wear hiking boots that is best. There are various terrains that you will encounter and hiking boots will handle them all. If you have kids with you having them carry their own packs filled with snacks and water will help them along their way. Bring lots of water. Toward the end of our hike that was the complaint because we had anticipated seven miles not the twelve that it ended up being. Better to be prepared. Being that we live in southern Oregon in Medford it took us about 4 and a half hours to get there making for a great weekend trip. It was such a great hike for Ilias and Olivia to train on for longer distances. They are growing their love for outdoor adventure and we couldn't be happier to share it as a family. You won't want to miss this amazing experience; it will be one that you will never forget! Make sure to follow us on social media. We share our daily adventures, favorite foodie finds, and current events!